The Greek Textus Receptus underlying the KJV was first edited by Desiderius Erasmus and published in 1516. Erasmus had before him a half-dozen manuscripts during the editing process. Critics are quick to seize upon this "flaw" of the Textus Receptus to deride the KJV. However, these criticisms are unjustified. In any event, the fact that Erasmus had only a handful of manuscripts during his preparation of the 1516 edition is irrelevant in regards to the reliability of the text underlying the KJV. First of all, no scholar disputes the fact that Erasmus had studied variant readings of the New Testament throughout his life prior to publishing the Textus Receptus. In fact, the study of variant readings in the Greek New Testament did not begin with Erasmus but with scholars such as Thomas Linacre (1460-1524) and John Colet (1467-1519), and even as far back as Jerome (347-420). Although Erasmus spent only two years in front of a handful of Greek manuscripts to compose his first edition, his knowledge concerning the Greek New Testament and its variants did not come solely from looking at these few manuscripts in the two year period. Secondly, the KJV was completed in 1611 – almost a century after Erasmus composed his first edition of the Textus Receptus in 1516. The KJV translators most likely used the 1598 edition of Beza. At least three-quarters of a century of scholarship had gone into the Textus Receptus by the time of the KJV. 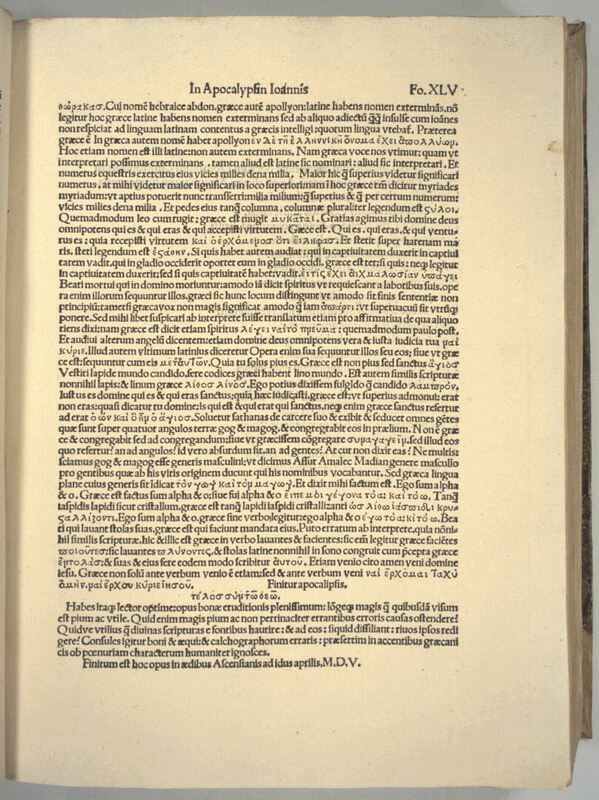 Erasmus updated his Textus Receptus in 1519, 1522, and 1527. Stephanus also edited the Textus Receptus in 1546, 1549, 1550, and 1551. Beza edited the Textus Receptus nine times between 1565 and 1604. Critics are quick to point out that Erasmus back-translated the last six verses of Revelation for his 1516 edition. But despite this charge, we see that Erasmus included a reading in Revelation 22:20 that exists in the Greek and not in any edition of the Vulgate (i.e. "αμην ναι ερχου (Amen. Even so, come)” instead of “amen veni (Amen. Come)"). This is one evidence that Erasmus was not confined to the readings contained in the few manuscripts placed before him during his editing of the 1516 edition. At the very least, Erasmus consulted notes such as the annotations of Laurentius Valla (link to scanned image). The charge with respect to Erasmus' treatment of Revelation 22:16-21 is dealt with in this article (link) on this website. The analysis shows that the only translatable differences between the Textus Receptus and other extant Greek manuscripts are two small words: καὶ and γὰρ. As for the alleged "countless hundreds of printing errors" in Erasmus' first edition, these were corrected in later editions of the Textus Receptus by Erasmus himself and others, and never made their way into the KJV. Matthew 1:11, Matthew 26:26, Luke 10:22, Luke 17:36, John 18:13, Acts 25:6, Ephesians 6:9, James 2:18, 1 Peter 2:21, Peter 2:2, 11, 18, 2 John 8. This shows that the KJV translators were not translating in a Textus Receptus vacuum. There were other manuscripts available to the KJV translators, and yet they used the Textus Receptus. Lastly, the majority of manuscripts that have been discovered and catalogued in the past four hundred years agree more with the Textus Receptus than with the modern Nestle-Aland/United Bible Society (NA/UBS) text. The majority of these manuscripts, termed the Byzantine Majority Text by scholars such as WilburPickering, Zane C. Hodges, Maurice A. Robinson, are in the Byzantine tradition which generally agrees with the Textus Receptus. The Byzantine/Majority Text (2000) can be viewed at Biblos.com. While it is true that no extant Byzantine manuscript matches the Textus Receptus perfectly, the same could be said that no extant Alexandrian manuscript matches the NA/UBS text. The NA/UBS text is highly edited, being a composite text of readings from Codex Sinaiticus, Codex Vaticanus, and other manuscripts, all of which disagree with each other in thousands of places (John William Burgon, The Revision Revised, p. 11). With respect to the differences of whole verses, Codex Vaticanus does not have Matthew 12:47, forty-five chapters of Genesis, portions of Hebrews, the Pastoral Epistles, and Revelation. Codex Sinaiticus does not have Matthew 24:35, Luke 10:32, Luke 17:35, John 9:38, John 16:15, John 21:25, and 1 Corinthians 13:2. Papyri are just fragments of various books.